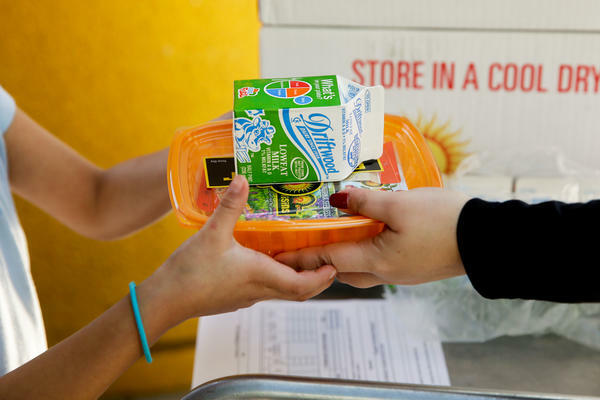 A student receives her afternoon snack at Kingsley Elementary School in Los Angeles. Many of the students at the school in a low-income neighborhood of Los Angeles eat breakfast and lunch provided by the school. "These numbers are great," says Duke Storen, senior director at the No Kid Hungry campaign, a national nonprofit effort to reduce childhood hunger. Storen says he wasn't surprised by the decline because the economy has been improving, but he thinks there are other reasons as well. Indeed, the Agriculture Department credits food aid, such as free or reduced-price school meals and SNAP, the Supplemental Nutrition Assistance Program (formerly known as food stamps), for keeping more people from going hungry. About 59 percent of food-insecure families said they received some government food assistance in the month before they were surveyed last year. It's rare to get good news when it comes to hunger, but the Agriculture Department says last year there was a big drop in the number of hungry people in the U.S. And that drop was dramatic among children. NPR's Pam Fessler reports. PAM FESSLER, BYLINE: The numbers are still fairly high. Children in about 274,000 households were hungry at some point last year according to the USDA. Those children either had inadequate food, missed meals or went all day without eating because their families didn't have enough money. But as bad as that was, hunger was less widespread last year than it was the year before and at its lowest level since before the Great Recession. DUKE STOREN: These numbers are great. FESSLER: Duke Storen is senior director of the No Kid Hungry campaign, a national non-profit effort to reduce childhood hunger. Storen says he wasn't completely surprised because the economy has been getting better, but he thinks there are other reasons for the decline in hunger. STOREN: We're seeing more children participating in the programs that are available to them, like school breakfast. FESSLER: And in fact the Agriculture Department credits food aid such as the Supplemental Nutrition Assistance Program, or SNAP, for keeping more people from going hungry. And the government says hunger declined last year across the board in black families, in Hispanic families, in families with children and in those without. Even so, almost 16 million households say they struggled to get enough food to eat at some point during the year. Rhonda Chafin runs Second Harvest Food Bank of northeast Tennessee. RHONDA CHAFIN: You know, we're not stepping back and saying we don't need as much food because honestly I think that, you know, our numbers sometimes fluctuate. And I think when we average them together for the year, we'll see a steady number of individuals that we're serving. FESSLER: She thinks one reason is that unemployment in her rural area has recently gone up. Still, anti-hunger advocates are encouraged that the numbers overall showed the biggest improvement in eight years. Pam Fessler, NPR News, Washington. Transcript provided by NPR, Copyright NPR.